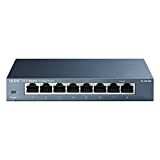 TP-LINK Product Description From the Manufacturer 8-Port 10/100/1000Mbps Desktop Switch TL-SG108 What This Product Does The TP-LINK 8 10/100/1000Mbps Desktop Switch TL-SG108 provides you an easy way to make the transition to gigabit Ethernet. Increase the speed of your network server and backbone connections, or make gigabit to the desktop a reality. Moreover, TL-SG108 adopts lower power consumption design. With the innovative energy-efficient technology, the TL-SG108 can save up to 72% of the power consumption, making it an eco-friendly solution for your home or office network.